Not the type of clippers you were looking for? Check out our review of the best dog hair clippers instead. When a dog is uncooperative, it is difficult for any pet owner to trim their nails. Many people fear trimming their dog’s nails too short or nipping the quick, which can cause bleeding and leave behind tiny droplets of blood in the home. By using the proper dog nail trimmer, one can greatly reduce the chances of a mishap occurring and can focus on safely cutting their dog’s nails. Since dogs come in many shapes and sizes, there is no perfect nail clipper that is suitable for them all. It is imperative that one purchases and uses the appropriate trimmer that will best fit over their dog’s nail for the perfect cut. Doing research and gaining knowledge on the various dog nail clippers available on the market will definitely make this process easier, and this guide aims to help you do that. Below is our best dog nail clippers review. This trimmer comes with a plastic molded handle for a superior grip, as well as a stainless steel blade for a clean cut. 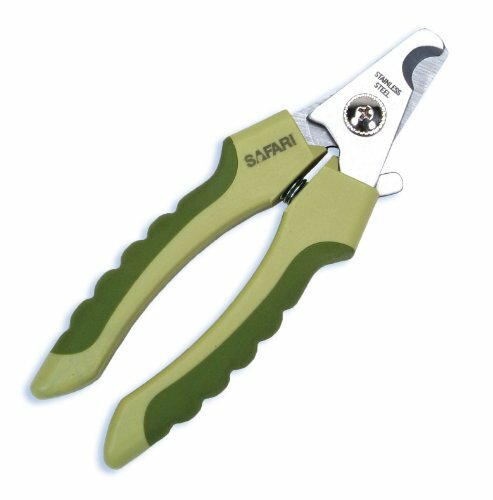 The trimming edge of the Safari W6107 has an integrated double blade as well as a safety stop to protect against injury. This dog nail trimmer is best suited for use on medium to large dogs. This is a professional nail clipper suitable for most dogs. The FURminnator 104014 features an antimicrobial handle that is further reinforced with a plastic covering. This clipper is a single shaft trimmer, meaning it can be used with only one hand. Furthermore, the stainless steel blade helps users with easy trimming and safe cuts. This clipper is small and features a guillotine style blade. The Bamboo 810001 comes with a storage compartment for styptic powder as well as a filing blade located in the handle. The blade itself is made of stainless steel and can be removed and replaced if dull. 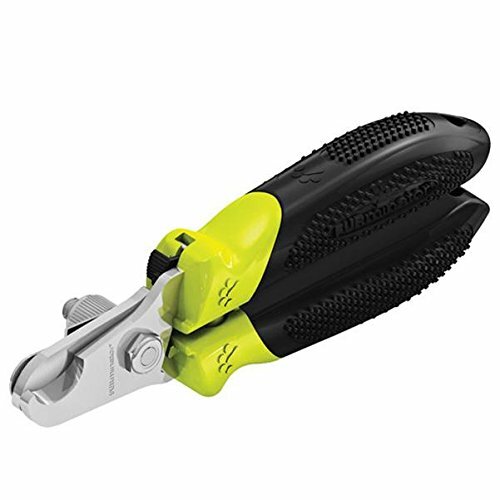 The Resco PF0732 comes with a sharp trimming edge and a medium sized opening perfect for trimming the nails of small to medium sized dogs. The ergonomic handles are also easily gripped and has a powder coating that allows one to further increase their grip; no more worrying about accidentally dropping the trimmer. If the blades on this clipper become dull, they can be removed and replaced. This heavy-duty nail clipper can be used for dogs of nearly all sizes. 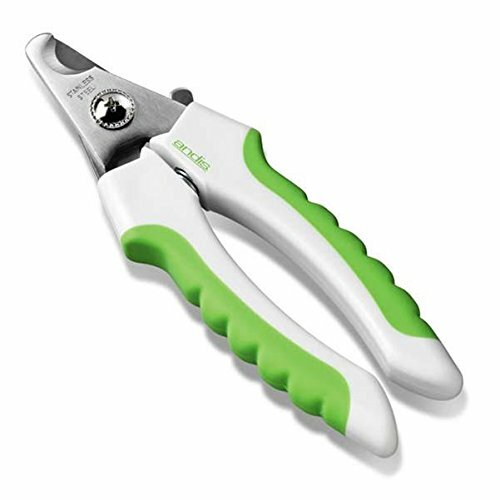 The Andis 65700 includes an ergonomic handle, anti-slip coating for extra grip, stainless steel blades, and a safety lock. In an effort to avoid over-cutting, the Andis 65700 has a safety stop mechanism built in. For dogs with medium to large nails, the Millers 767C Forge clipper is a fantastic high-quality tool for the job. This trimmer comes with a non-slip, grippable handles as well as a spring loaded action and sharp cutting edge for easier trimming. The Millers 767C can also be used for dewclaw removal and tail docking. 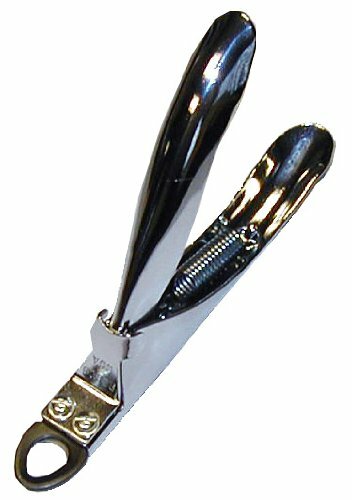 Ideal for small to medium sized dogs, this nail clippers comes with a spring loaded action as well as a stainless steel blade. The handle is designed to fit the grooves of your hands. The Conair PGRDNCS also has a non-slip grip coating as well as rugged indentations for extra grip and prevention of hand strain. The Resco PF0785 is a dog nail clipper that is nearly identical to that of a pair of scissors. The blades are attached to molded rubber handles with a soft rubber grip. It also has a double lock pivot screw and a sharp stainless steel blade. The Resco PF0785 is good for large dogs. The Resco PF0748 is a regular style dog clipper with a chrome plate coating. The blade of this trimmer has a large enough opening for trimming the nails of any sized dog. When squeezed, the handle pushes the stainless steel guillotine blade over the nail, leaving behind a clean cut. Furthermore, the blades on this trimmer can be replaced when dull. Lastly, the JW Pet 65105 is a dog nail clipper that is designed with safety in mind. This trimmer comes with a nail guard that protects the user (and dog) from cutting the nail too short and damaging the quick. That means no bleeding and no frightened dog, and more peace of mind. Additionally, the JW Pet 65105 also comes with a soft grip handle and stainless steel blades. Before you start trimming your dog’s nails, it is imperative that you are using the right tools. Obviously you should have some sort of nail clippers for dogs, but there are many styles available. Which one should you use? The correct answer depends on how big your dog is, as well as what you are most comfortable with. Below you will find some information on the top types of nail trimmers for your dog that is available on the market today. 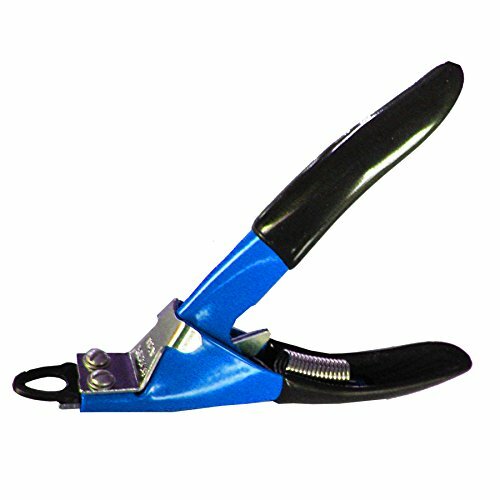 This type of nail clipper consists of an internal blade as well as a hole to line up the dog’s nail. Once the handle is squeezed, the blade shoots up to clip the nail, similar to an upside-down guillotine. Many beginners prefer to use this type of trimmer due to its ease of use. With that said, it is imperative that one holds this trimmer properly so that it will function correctly. For starters, when trimming, the handle should be below the dog’s paw, and the nail hole should face upwards. Furthermore, the screws on the clipper should point in the direction of your dog. Afterwards, you will need to line up your dog’s nail inside the hole of the guillotine trimmer at the right spot to make a proper cut. Once the internal blade begins to dull after repeated use, it will need to be replaced. For the best results, use the guillotine trimmers on small to medium sized dog nails; they are not as effective for very small or large nails. Like the name implies, the scissors style trimmers work exactly like a regular pair of scissors. In terms of how it looks, a distinction it has is that it sports a curved blade instead of a flat cutting surface; this allows it to cut rounded nails more effectively. Using the scissors style trimmer is simple. All you need to do is line up the blade where you want to cut and have at it. 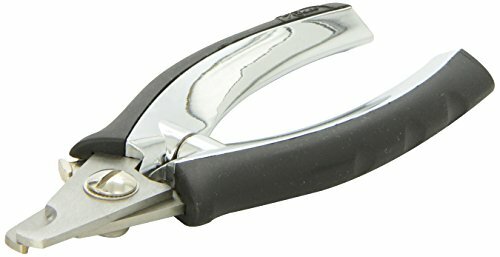 With that said, this specific type of dog nail clipper is only ideal for smaller nails, since they are not sturdy enough to slice through larger nails. Fortunately, the scissors style trimmers are typically the most affordable variation of trimmer. Be wary of the blade dulling over time as well as loose hinges on the trimmer. This variation is usually the style of choice among professionals. 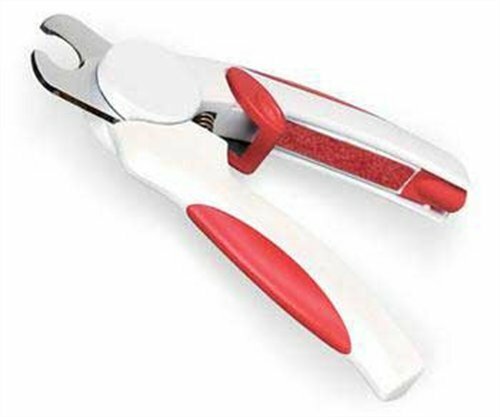 Pliers style clippers function similarly to scissors style clippers, but with much more force. They are fully loaded with a spring mechanism that resemble that of a garden pruner. The small-medium sizes are excellent for use on small to medium sized nails. 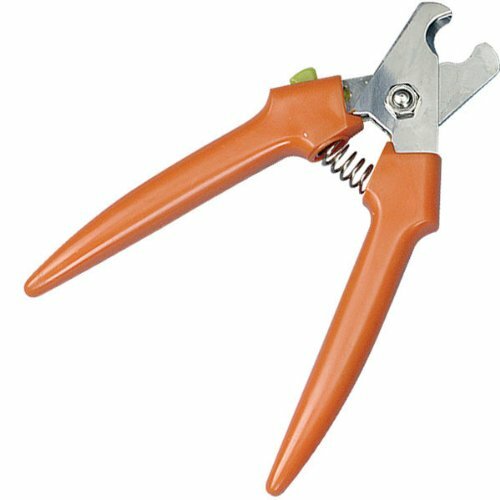 Large sized pliers are effective for nearly all nail sizes with the exception of smaller nails (as they may result in frayed nails). This style of trimmer is extremely easy to use and are highly durable. However, the blades cannot be replaced and will eventually dull (though this can take years to occur). Cutting the nail too short will lead to bleeding. Especially if you are a novice, you will most likely make a couple of mistakes when clipping your dog’s nails. Putting pressure on a bleeding nail will eventually stop the blood loss, but you may find it difficult to keep your dog still for several minutes. The solution to that problem is styptic powder – it can stop any bleeding instantly and is easy to apply. If you do not have any styptic powder on hand, some alternatives are flour or corn starch. Apply these to the bleeding the same way you would the styptic powder. Additionally, keeping cotton balls, Q-tips, paper towels, or tissues nearby will speed up the cleanup time.